The sheer volume of samples involved and presets programmed is impressive, and it'll take us a long time to run out of uses for them. One of UVI's best yet, no question. Huge range of samples. Quality presets. Instruments are fun and easy to use. There's an almost overwhelming amount of material in UVI's latest, a collection of five sample-based instruments for producers of hip-hop, trap, R&B and the like, supplemented by 140 construction kits. "All of the interfaces are flexible, responsive and well designed, particularly Urban X (the synth)"
Borrowing a fair bit of engineering from UVI's Electro Suite, the instruments comprise two drum machines (a solid TR-808 emulation and a superb general purpose one that divides its kick, snare, clap and hat sounds up into editable stages or components), a three-oscillator synth, a multitrack REX file player and a vinyl scratch emulator. 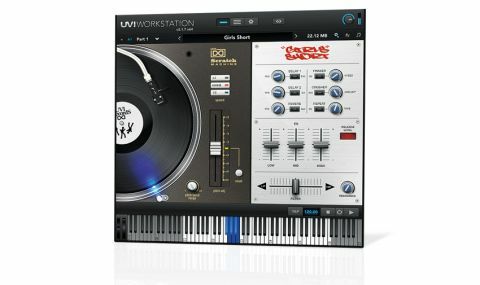 All are entirely sample-based, but their interfaces are flexible, responsive and well designed, particularly Urban X (the synth), which plays beautifully and sounds incredible, and Scratch Machine, which is admirably honest in its controlled approach to scratch emulation and works all the better for it.